Cheval Gloucester Park is close to smallcarBIGCITY tours. We, at Cheval Residences, always say: the best way to discover London is to do things like a londoner would do. And when it comes to riding a car, nothing is more english than a Mini Cooper. So why not a London private tour in a Mini Cooper, with someone ready to tell you all about this great city that is London? Stylish right? The Small Car Big City does exactly that. With tours from 30min to 2h, prepare to fell like a real londoner inside this iconic car. 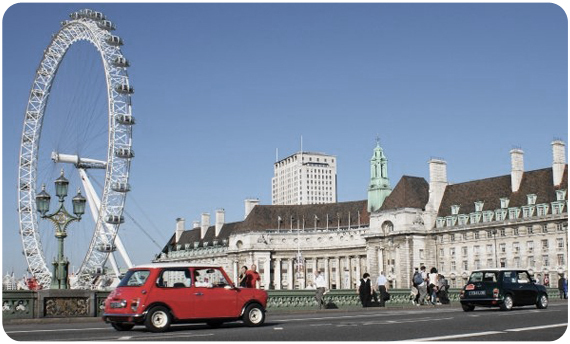 With a fleet of beautifully presented classic Mini Coopers to take you round all of the sights for the ultimate guided tour of London! The Great Escape Tour covers every sight in London - Buckingham Palace, London Eye, Houses of Parliament, Big Ben, St Pauls Cathedral and many more that you have yet to discover. You can even learn about the royal couple in London on the William and Kate Tour. If your feeling like an adventure, get your team together, and try "The London Job" tour. Put on your tweed cape and overalls to try to escape London. Can you escape the city with a car full of gold? The Tours consist of the driver, and 3 seats in the Mini. The driver is your guide as you roll through historic London listening to classic 60's music. You'll hear historical facts, and stories at the actual location where they happened. They're full of interesting tid-bits, trivias, and because of the Mini's small stature traffic is almost never a problem. You'll just squeeze right past. The cars are also for hire: half days, full days or even for photoshootings. A little history: The first Mini was invented by Sir Alex Issigonis and was born on the 26th August 1959. This cheeky little car revolutionised the automotive industry because of the way the engine was mounted – on its side rather than forward facing, as was the conventional method. Everyone from Twiggy to the Beatles had a Mini, and as a result the car has become a British design icon of the 1960s. Out of the 1.5 million that were sold, only a fraction still remain and they are now classed as collectors' items.